Upon entering the exhibition hall recently at the UK Games Expo, leaflets from various developers were thrust into my hands. “Come check out our game!” they all read. Zombie Babies was one of those and, after going to see them at their stall, we came home with the pre-kickstarter prototype to try out. 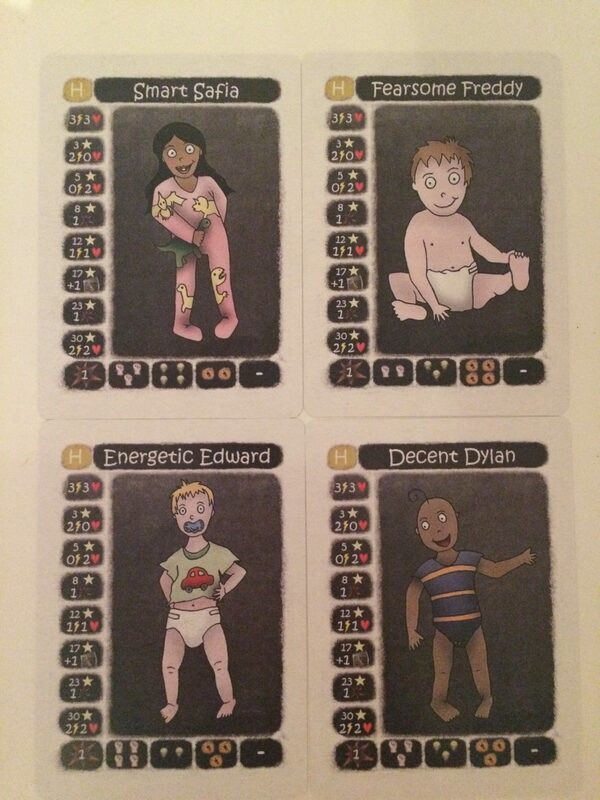 In Zombie Babies, you and your friends pick one if the four Hero babies each. The story goes that you have been dropped off at nursery like any other day. However, all is not right as the rest of the babies have become a little carnivorous and all the adults are gone! You need to survive the day by working your way through the nursery and fighting the Zombie Babies! 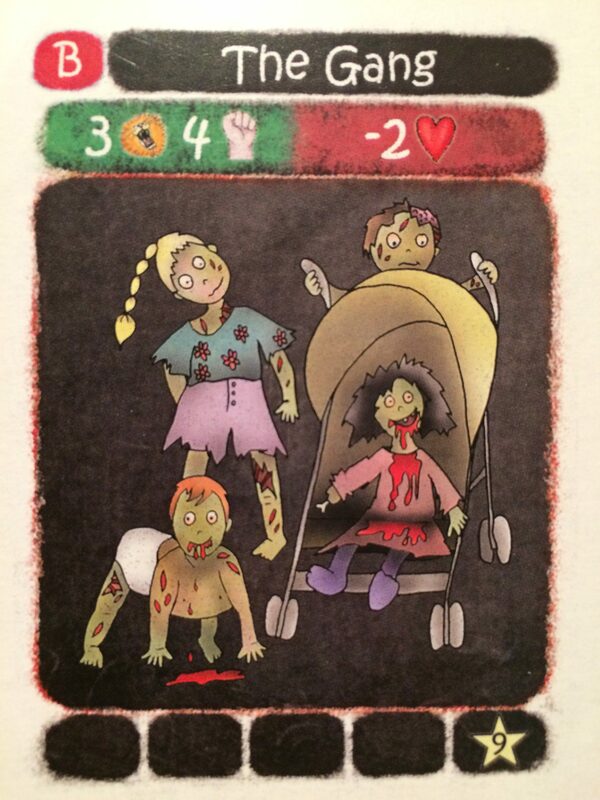 Zombie Babies thus forms the mechanic of a card based character builder. The heroes all start out with some base stats in Strength, Intelligence and Bravery. 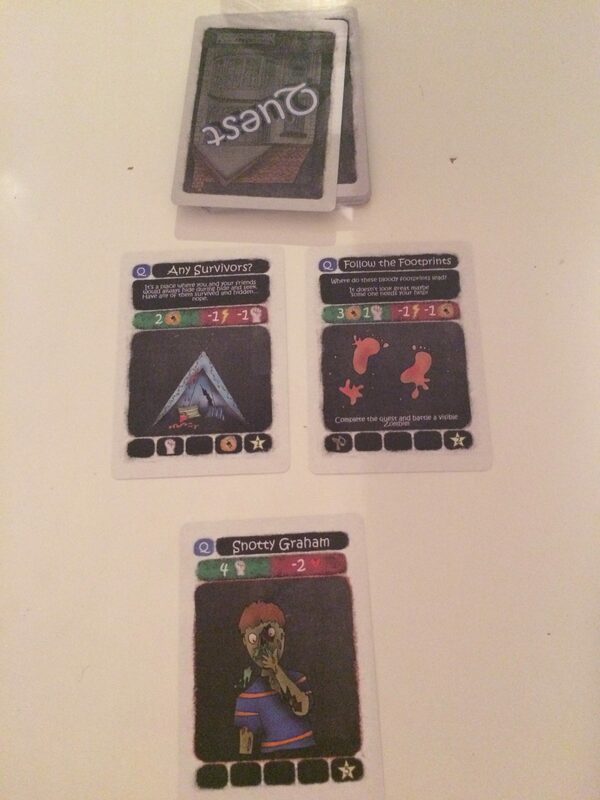 You form a deck with all the zombies and rooms of the nursery, and at the bottom place a random boss. At all times you have three quest cards out on the table in front of the heroes and, during their turn, they chose to take on one of the quests. Zombies are hard to kill, but reward a lot of XP. Locations tend to reward you with some XP, usually a stat and sometimes an item. If you collect an item, you draw it from the item deck add it to your character. Items also tend to improve a stat or two of your character. And stats are of course important when it comes to taking on quests. To complete any quest you will need to beat a score or two out of the three stats. To do this, you take the number of dice equal to your score in that stat, roll them, and try to equal of better the score required. It’s a well used technique that generally works very well. However, there are a few issues with it in Zombie Babies. Firstly are the dice themselves. 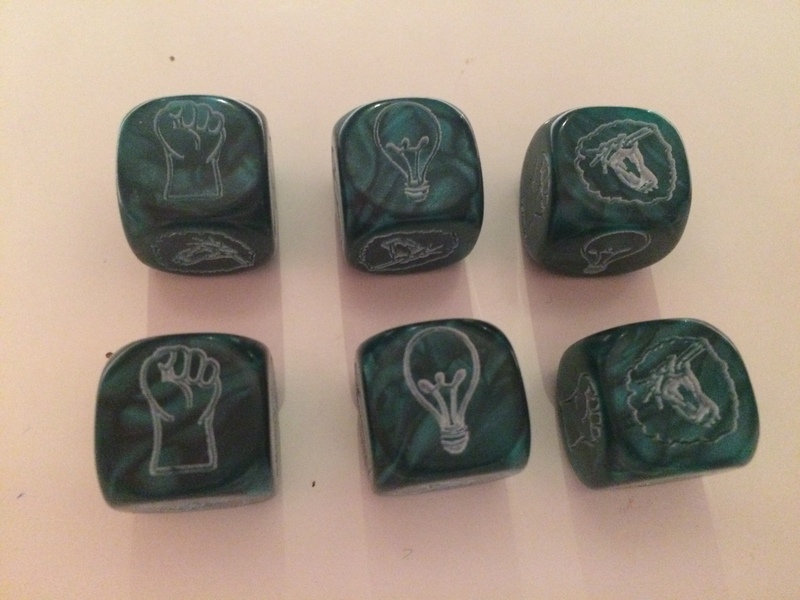 In the preview copy we received the dice are black with white lining of the symbols. A fist for strength. A light bulb for intelligence. But it took a good while for me to figure out the third symbol. It’s a Lion for bravery. 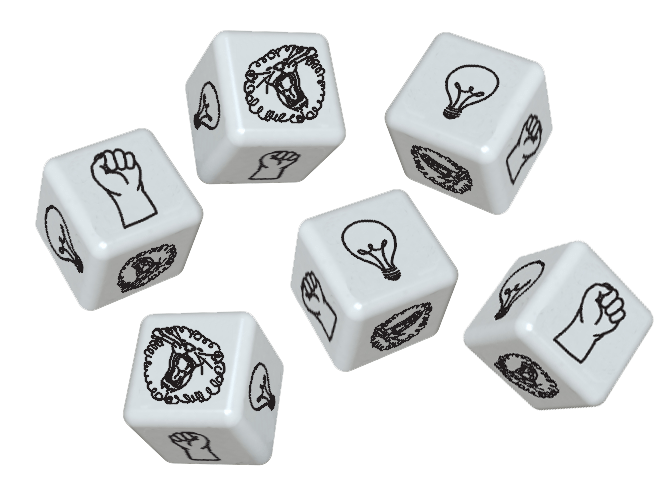 Now the press materials that we’ve been supplied suggest that in the production version of the game the dice will be white with black lining. But the Lion’s head doesn’t look any better. These same symbols are then on the cards so that you can keep track of your stats. When you defeat a quest or gain an item card, you slide it under your hero deck, leaving just the bottom showing so you can see the rewards you have stacked up. This way you count down a column to see how many Fists, Light bulbs or Lion heads that you have, and thus know how many dice to roll. And here is the next problem. You can actually end up with a higher stat than there are dice to roll. The rules don’t state what to do in this case, so we have just assumed that any stat maxes out at six (the number of dice in the box). It is possible to lose some stats too though. Along with everything mentioned above, your hero also has energy and health. If you fail to complete a skill test on a quest there is usually a penalty associated with that, resulting in the loss of some health and/or energy. On your turn you can choose to rest (take a nap) in order to regain some health or energy. Additionally, as you gain XP there are some level up rewards. These come mostly as additional health and energy, with the occasional extra re-roll added in. You can use your re-rolls on your turn to help you overcome challenges. Once you reach the bottom of the deck the Boss comes into play. The minute the Boss card comes out, all other quests are discarded and players fight the boss. The game ends either when the boss is defeated, or all players are dead. This is where there is another issue with the game. The concept of death. The rules state: “if you lose all heath, discard the last card under your hero and regain 2 health.” But this rule contradicts the aforementioned one on how the game ends. The first time we played the game it wasn’t a problem. Someone defeated the boss, we counted the XP gained and declared a winner. The second time we played, all players were throwing duff rolls against the boss and were dying. So we discarded a card, regained two health. Then failed, died again, discarded a card, gained two health. And so on. Until it got to the point where it was technically impossible to defeat the boss at all. The rules don’t state it, but it would seem that perhaps when you get to the boss, if you lose all health you are just dead. Otherwise the above predicament is entirely possible. There is a further mechanic I haven’t mentioned yet, the Special cards. These cards can be played at any time and will either affect you, an opponent, or a zombie card directly. Some examples can be seen in the image below. At the start of your turn you always draw to make sure you have two of these special cards in your hand. (One of the level up rewards mentioned earlier increases this limit to three). Generally speaking these cards are used as buffs, but the life saving ones are the cards that affect the dice, either by giving you extra re-rolls, or allowing you to directly alter the result of the dice. The cards that affect your opponent are really the only part of the game that really makes Zombie Babies a competitive game. This is another small issue with Zombie Babies. It IS a competitive game. After all, at the end you are counting the XP gained and whoever has the most is declared the winner. However, it doesn’t really feel like a competitive game while you are going through the quest deck. You aren’t really helping each other in any way either, yet it feels more like it should be a co-operative game. As mentioned above, the few special cards that allow you to screw over the other players are the only way you can affect how well the other players do in comparison to yourself. My final qualm is with the artwork. I get that they are trying to be a little crass, and that the drawings are about Zombie Babies. But the artwork just doesn’t do it for me. It’s just all a bit too amateurish. I already spoke about the dice, but the same icons are on all the cards (again, took me a while to get that it was a lion). The re-roll icon is described as “damage” which just further confuses things, and against the dark background of the cards is just really hard to distinguish. Some of the quest cards have a lot of text on them, and the chosen font also makes them quite hard to read. 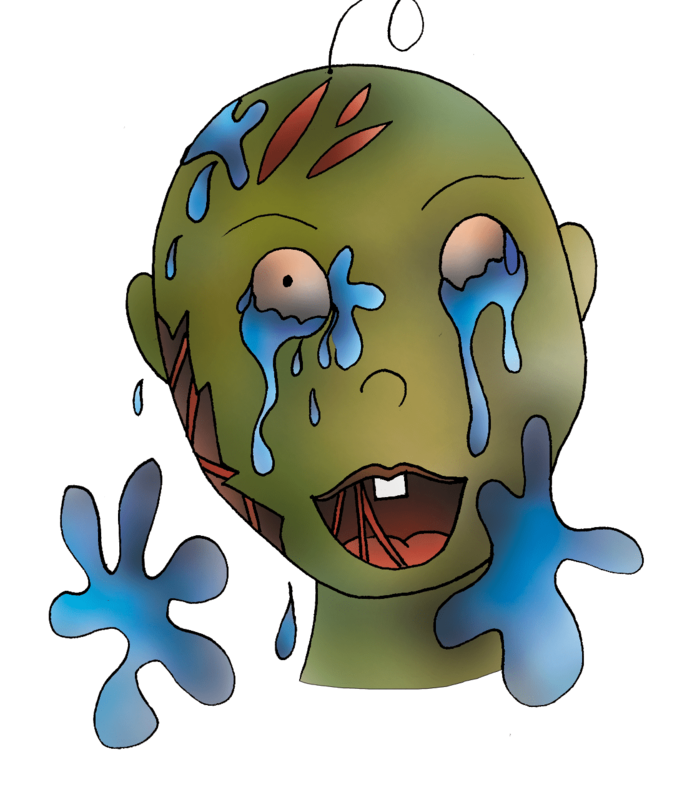 Zombie Babies launched their Kickstarter campaign at the start of July. From the campaign page it seems that a few points of feedback have been taken into account, such as moving the XP tracker to its own card, and switching the Health/Energy cards for tokens. I would definitely recommend that you check out the Kickstarter page for more information on the game and its mechanics. The core mechanics of the game do work well, it just needs some tightening up around the rules. And the artwork may appeal to some. Their stretch goals are hidden for now, but it would be interesting to know what they have planned for them.